Auburndale, WI (OnFocus) An Auburndale boy battling Leukemia is receiving support from the childcare center whose story he’s been a part of since its beginning. Gage, son of Jason and Jackie Zellner, was diagnosed with Acute Lymphoblastic Leukemia just shy of his 2nd birthday this January. While now in remission, Gage’s battle is still ongoing as he continues to take chemo treatment. 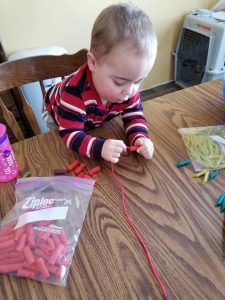 After Little Sprouts Learning Garden first opened its doors in December 2016, Gage’s mom called to secure a place while she was pregnant with him. Gage arrived at the center at just a few weeks old on a cold winter day, bundled up and ready for his first tour. He became part of the childcare family in April 2017. The staff all loved their time with Gage and treated him as one of their own. Gage was later joined by his baby sister, Willow, in July 2018. Because he couldn’t be exposed to other children due to the potential of contracting an illness that could slow his recovery, both needed to be removed from childcare, which meant that Jackie needed to quit her job. Gage’s parents still send updates to staff on his condition. There are several community benefits taking place to help the Zellner family with the journey ahead as they manage Gage’s medical treatments. Every year, the Auburndale High School Tractor Club raises funds for a special cause. Seever’s daughter Isabelle Hilber, part of the Auburndale High School leadership class and a Little Sprouts volunteer, helped nominate Gage to be the beneficiary at the Tractor Day fundraiser on April 26. The tractor parade “Grabbin’ Gears for Gage” starts at 8 a.m., going from HWY P through town to the high school. The deadline for T-shirt forms is April 10. The Tractor Club will also hold a brat fry on Wednesday, April 17 from 11-4 p.m. at the Auburndale High School outdoor concession stand. To call ahead or for delivery, contact Reese at 715-459-3244. A benefit is being held May 18, 2019 at the Wildhorse Saloon in Wisconsin Rapids. From 11-3 p.m., a kid’s carnival with bounce house, face painting, carnival games, and treats like cotton candy and popcorn will be held. Rosco and Miss Wisconsin Rapids will make a guest appearances. Teams can sign up for the bag tournament taking place from 4-8 p.m. Brad Janssen will perform from 3-6 p.m. and Genesee Depot from 8-12 a.m. Food, drink, and raffles are available all day. Shirts can be pre-ordered here and will be ordered closer to the benefit. Follow Gage’s Journey at the Facebook page, Gage’s Battle.